1. It is April 4th and I had to turn on my A/C yesterday... ugh 82... really???? Did I mention I hate heat? Sweating in my bathroom while trying to get ready to go out last night sealed the deal. The air is on! 2. I am taking my kids on a little field trip tomorrow. We are huge Walking Dead fans, yes the kids love it too. The show is filmed here in GA all over the southern part of the state but bits and pieces in Atlanta. So tomorrow we are heading to Terminus! Its actually an old train depot near Turner Field downtown but apparently you can walk around and see where this was actually filmed. Should be exciting! 4. I ordered a cute new bag from Etsy and I am really hoping it comes today cause I want to carry it all weekend long. 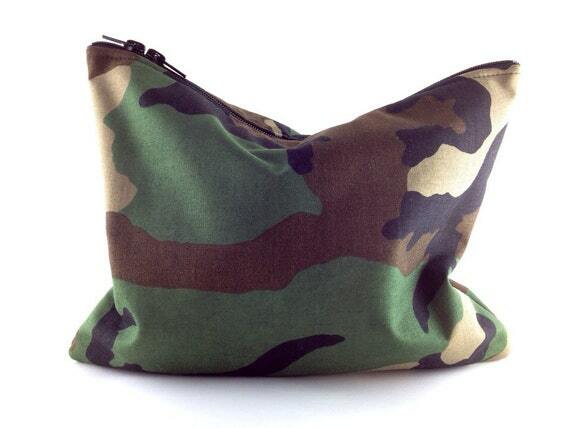 I love all things camo and I am a little obsessed with cute clutches. I definitely don't feel bad for you about the heat. I'd kill for some beautiful days! what? you're going to Terminus?! LOL so awesome. That pizza... good LAWD get in muh bellay! I have the doorwall open right now getting a nice little breeze... feels so damn GOOD!